Early in December 2012, a South Korean vessel called the Premier entered the Indian Ocean to fish. In West Africa, authorities knew that the boat had been fishing illegally in Liberian waters before it made its way to Africa’s other coast. That raised the ire of East African countries, which weren’t keen to welcome a lawbreaker into their seas. Kenya, Tanzania, Mauritius, the Comoros, Mozambique, and the Seychelles rapidly mobilized against the vessel, shutting it out of their ports and refusing to grant it a fishing license. “All of a sudden, the Premier was surrounded by countries that were saying no to everything,” recalls Benedict Kiilu, a Kenyan principal fisheries officer who was part of the team that tracked the vessel at the time. In 2013, unable to land its catch, the disgraced ship was finally driven out of the region. Ultimately, it was forced to pay US$2 million to Liberia for plundering its fish. The beating heart of this crime-busting, resource-conserving effort was FISH-i Africa, a network of countries committed to sharing fisheries intelligence that was established in 2012 by the not-for-profit Stop Illegal Fishing. Composed of the six countries that drove out the Premier, along with Madagascar and Somalia, FISH-i Africa seeks to form a united front against illegal — or “pirate” — fishing. “It’s eight like-minded countries working together to share information and stand shoulder to shoulder where illegal fishing is concerned,” says Tony Long, director of the Pew Charitable Trusts’ Ending Illegal Fishing Project, which provides technical support to aid FISH-i’s efforts. Before you continue: to our supporters, thank you. To newcomers, please know that reader-supported Facts and Opinions is employee-owned and ad-free. We continue only because readers like you pay at least 27 cents per story, on an honour system. Please contribute below, or find more payment options here. Because illegal fishing is unregulated — meaning catch is concealed and almost impossible to trace — it has become a major driver of overfishing. By flouting the rules designed to protect certain habitats and species, it can also undermine vulnerable ecosystems and threaten marine species. But, where attempts to fight it were once hampered by bureaucracy and snail’s-pace information sharing between countries, now they’re happening in real-time on FISH-i’s digital communications platform. Here, member countries exchange vessel license lists, news about suspect activities and details obtained during port inspections to build up a record of the vessels entering their waters. FISH-i also closely tracks vessels’ activities on the high seas using satellite data and shares that information via the platform. This helps authorities flag vessels that may be fishing in off-limits areas, or those that betray unusual travel patterns that suggest they’re transferring fish illegally between boats. Ideally, these investigations can reveal whether vessels have appropriate licenses, where they’ve been fishing and perhaps if they have a criminal record. Countries that wise up to illegal fishers’ transgressions then have grounds to shut their ports to these vessels so they can’t sell their catch or even to force them to pay fines, as in the case of the Premier. “It’s a real financial loss to the [vessel’s] owner, which means illegal fishing isn’t profitable anymore. That’s really what we want to achieve,” says Per Erik Bergh, managing director of NFDS Africa, a consultancy that works to combat illegal fishing in Africa and provides support to FISH-i. The platform was created to reclaim the estimated US$200 million in revenue that the eight FISH-i countries lose annually to illegal fishers invading East African waters. Home to the world’s second-most productive tuna fishery, this region attracts commercial fishing vessels from around the world, including illegal fishers — whose activities range from using false flags, fake licenses and fictitious names to fishing prohibited species and fishing in protected waters. “In the past a vessel might be fishing illegally, and one country might say, ‘You can’t come to my port,’ whereas the next country would say, ‘Come to mine.’” – Tony Long“They’ll exploit the lack of international collaboration and take advantage of a patchy system,” says Long. “In the past a vessel might be fishing illegally, and one country might say, ‘You can’t come to my port,’ whereas the next country would say, ‘Come to mine.’” This loophole is exactly what FISH-i is now trying to close. So far, the united front is working. Since it was founded, FISH-i has been involved in more than 30 investigations of suspect ships. 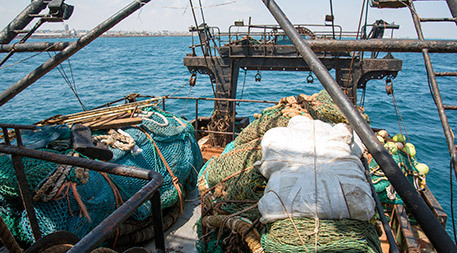 It has identified criminal networks distributing fake fishing licenses in Tanzania, exposed vessels using multiple fraudulent identities and tracked down fugitive ships. Its relationship with INTERPOL, the international crime investigation agency, also enables FISH-i to widely share and receive information about pirate fishing. “Some of the investigations we are doing are going into quite substantial organized crime networks,” says Bergh. FISH-i’s evolving satellite detection system is also helping it get around the hurdle of illegal vessels that try to avoid discovery. “There are very sophisticated structures illegal fishers are using to hide their operations and their locations, which is what we’re trying to deconstruct,” says Duncan Copeland, chief analyst of Trygg Mat Tracking, a not-for-profit fisheries intelligence resource that provides technical support to FISH-i. Some ships turn off their automatic identification systems, for instance, which makes them impervious to satellite tracking. Copeland is helping to build a system that combines multiple layers of information to help FISH-i pinpoint criminal ships with greater precision. But can FISH-i’s team of African nations have an impact on the decidedly global problem of illegal fishing? John Amos, president of the nonprofit SkyTruth, thinks so. Recently SkyTruth, Google and the marine advocacy group Oceana launched Global Fishing Watch, an open-access satellite platform that reveals the location of any trackable ship in the world. In addition to earmarking criminals, there’s evidence that FISH-i’s activities deter crime, too. Its huge global scope has attracted widespread attention — but Amos also sees the benefit of regional efforts like FISH-i’s that home in on local waters. In addition to earmarking criminals, there’s evidence that FISH-i’s activities deter crime, too. Whereas vessels used to fish without a license and face few consequences, now they know they’re being watched. According to Kiilu, some FISH-i countries have seen a 33 percent rise in fishing revenue as vessels purchase more licenses. Other countries are taking note of this success. “The impact is so great that other parts of Africa are copying what we do,” says Kiilu. “We’re a specimen for study.” In West Africa, where illegal fishing usurps several hundred million dollars a year, the West Africa Task Force was formed in 2015 by six nations to combat illegal fishing — and it’s based entirely on FISH-i’s model. “There is certainly the goal to eventually see more of these task force type structures set up in other regions,” Copeland says. Recently, FISH-i’s newest member, Somalia, had its first major triumph when in October it cornered the Greko 1 — a fake-flagged vessel that not only was fishing without a license using banned trawl nets, but also had invaded an off-limits area reserved for Somali fishers. “By taking action against the Greko 1, [Somalis] are sending a strong signal that they will act against illegal fishing,” says Bergh. For FISH-i, it’s yet another sign of its success — proof that its unique, collaborative approach really works to protect the ocean’s natural resources across its range. This article first appeared on Ensia, and is republished here under a Creative Commons licence. Facts and Opinions is a boutique journal of reporting and analysis in words and images, without borders. Independent, non-partisan and employee-owned, F&O is funded by our readers. It is ad-free and spam-free, and does not solicit donations from partisan organizations. To continue we require a minimum payment of .27 for one story, or a sustaining donation. Details here; donate below. Thanks for your interest and support. F&O’s CONTENTS page is updated each Saturday. Sign up for emailed announcements of new work on our free FRONTLINES blog; find evidence-based reporting in Reports; commentary, analysis and creative non-fiction in OPINION-FEATURES; and image galleries in PHOTO-ESSAYS. If you value journalism please support F&O, and tell others about us.